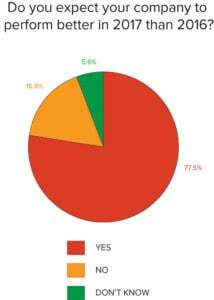 Recently Pump Industry undertook its fourth annual State of the Industry survey. The survey’s results provide insights into current trends in the industry, areas for growth and opportunity, what has or hasn’t been working for companies over the last year, and the industry’s outlook for the year ahead. Our survey results suggest that 2016 was a mixed bag for the pump industry. While some companies reported exceeding their expectations for the year by various degrees, and a good number of others performed as expected, many still fell short due to a range of factors, including restricted government project expenditure, reduced market confidence, increased competition from imports, lower oil prices, economic downturn and political uncertainty. However, while 2016 undoubtedly had its challenges, the majority of survey respondents were positive about what 2017 might bring. 70.4 per cent of respondents thought their company’s outlook for 2017 was positive, while 21.1 per cent had neutral expectations for the year. Only 5.6 per cent of respondents had a negative outlook for 2017, while 2.8 per cent were unsure what to expect. These results are shown in Figure 1. 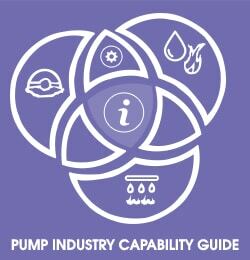 These results signify greater confidence and a more positive general mood within the pump industry than last year, when around equal numbers of respondents expected to perform better (45 per cent) or the same (44 per cent) than during the previous year, and eight per cent expected to perform worse (Figure 2). This increased optimism was also reflected in responses to the question of whether respondents expected their company’s 2017 performance to exceed that of 2016. As shown in Figure 3, 77.4 per cent of respondents answered in the positive, while 16.9 per cent didn’t expect better performance, and 5.6 per cent weren’t sure. Comparing the results of the first two questions of this year’s survey suggests that some respondents expected their company’s performance to improve in 2017, but still did not consider the year’s outlook to be positive overall. Possible explanations for this include that some respondents considered an increase in performance as a neutral result, perhaps because the expected improvement was not huge, or that, for some companies, the expected 2017 improvement was required to make up for a slower 2016, but wouldn’t necessarily result in burgeoning growth. Similar to last year, our respondents were more confident about their own company’s outlook than about the outlook for the industry in general. 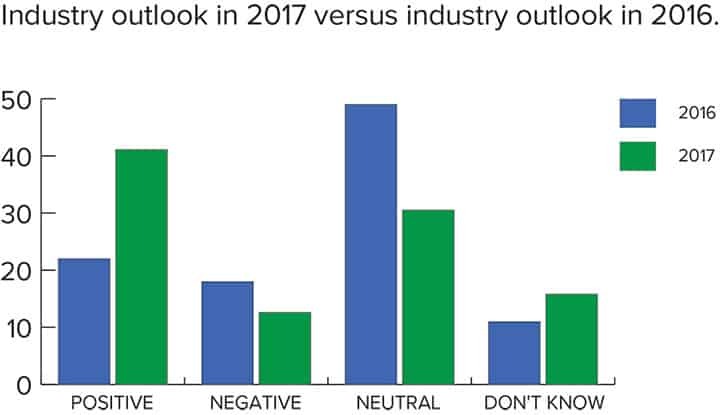 41 per cent of respondents expected 2017 to be a positive year for the industry, 30.5 per cent had neutral expectations, while 12.6 per cent thought the industry as a whole was in for a bad year. 15.8 per cent were unsure about what 2017 would bring. These expectations are considerably more favourable than results for 2016, as shown in Figure 4. Key to understanding the current state of the pump industry is to examine which particular verticals performed the best and worst for businesses during 2016, and to identify how key sectors are expected to fare in 2017. We asked our respondents how the volume of work across key verticals had changed for their businesses during 2016, and how they expected them to change in 2017. Figure 5 illustrates the actual reported performance of various verticals for our respondents during 2016, compared to their expected 2016 performance at this time last year, and their anticipated performance in 2017. Figure 5. Note the difference between expected performance in 2016 and the actual reported performance; as well as the significant expected increase across a range of verticals in 2017. According to our respondents, the best performing verticals in 2016 were water and wastewater, and irrigation. On the other hand, the vertical that performed the worst overall was mining, with the greatest number of respondents reporting a slight or significant decrease in the volume of work in that industry. 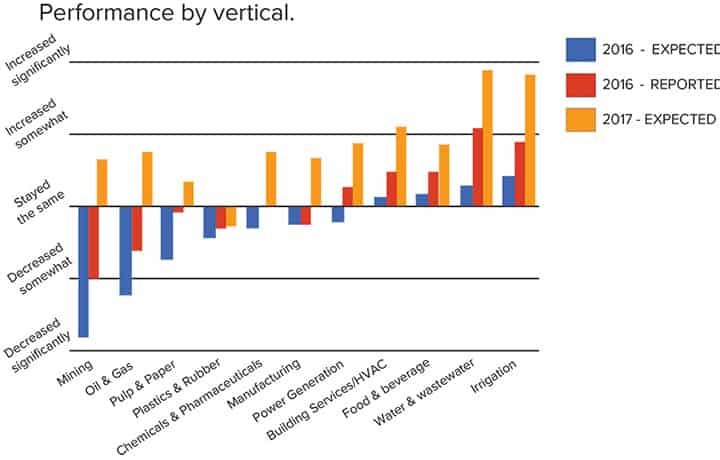 Overall, a greater range of verticals experienced increases in volume of work than in 2015, and fewer verticals exhibited overall decreases in work volume. These results fall relatively close to the expectations for 2016 expressed in last year’s survey results, suggesting that our respondents have their fingers on the pulse of the industry. Once again, our respondents considered the water and wastewater industry to be the biggest boom area. Most respondents thought the volume of work in this area would increase during 2017, and no respondents thought it would decrease at all. Significantly more work was also expected in irrigation. In contrast to last year, a greater percentage of respondents seemed to consider the sharp decline in the mining, and oil and gas industries to be coming to an end, with most respondents expecting the work volumes in these verticals to increase slightly or remain stable. Our respondents cited a variety of key factors that had impacted upon their performance, for better or worse, throughout 2016. Our respondents’ thoughts are summarised in Figure 6, which showcases the factors that have had a negative impact on the industry against the factors that have had a positive impact on the industry; and Figure 7, which summarises the overall impact various factors have had on the industry. Asking our respondents to identify the industry trend or external factor that had the single biggest impact on their businesses in 2016 unearthed a number of recurring themes. An increase in agricultural and irrigation projects was a positive for some respondents. 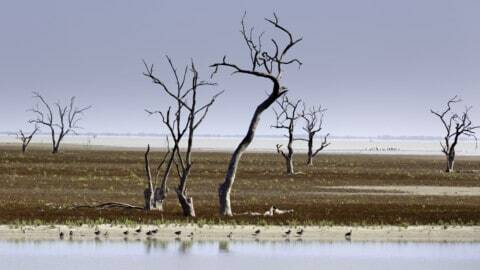 “The agricultural industry is experiencing a boom at the moment and there are still government grants available for private irrigation infrastructure upgrades,” said one respondent. However, other respondents said that, in their experience, higher rainfall had reduced irrigation requirements, which had affected their business negatively. This reflected a general trend in responses where some respondents cited an increase in greenlit projects as having positively affected their business, while others, perhaps operating in other states or industries, considered project spending to have dropped off, affecting their businesses negatively. Increases in electricity prices were also mentioned by a number of respondents, with companies that managed to take advantage of the increased demand for energy efficient or solar-powered pumping products reaping rewards as a result. “The rising cost of power is forcing larger agricultural producers to upgrade pumping plants to more efficient units,” said one respondent, while another cited solar pumps as the “next big thing”. Changes in the HVAC industry had caused real problems for a number of respondents, who expressed serious concerns about the quality of product being specified throughout the industry. Similar sentiments were expressed in other responses. “In the building services industry, D&C (design and construct) jobs have meant a lower standard in engineering and quality of product supplied, driving prices down,” said another respondent. Competition from cheaper imports, especially from Asia, also had negative impacts on a number of companies. Some respondents cited the downturn in mining as having the biggest negative influence on their business in 2016. However, others managed to make this trend a positive by capitalising on the mining industry’s “heavy focus on cost reductions and operational improvements”. Low commodity prices were a negative for some respondents, however a number said they expected them to improve during the next year. staff training. Weather conditions were also listed as a big influence on performance during 2016 by many respondents. Other respondents had received benefits from making the most of marketing opportunities. 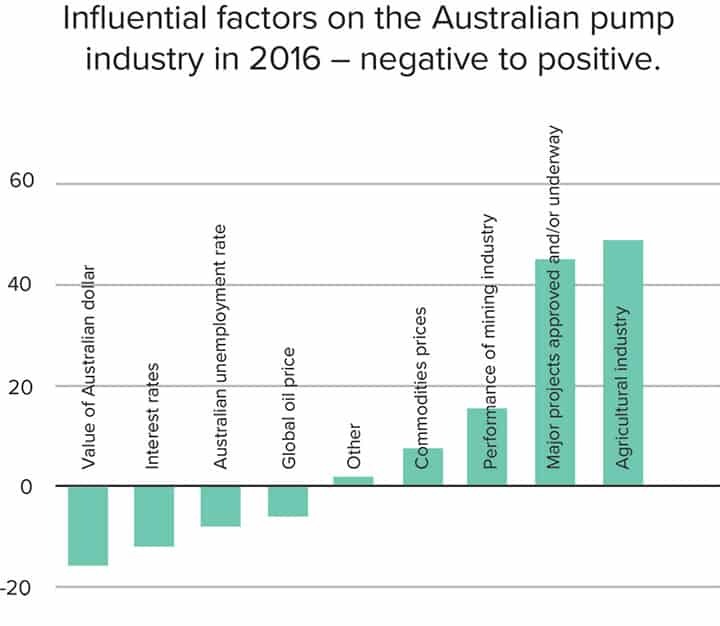 Looking forward into 2017, we asked our respondents about a range of economic trends and whether they thought they would have a positive or negative impact on the Australian pump industry. Trends that the majority of our respondents expected to have a positive impact on the industry included the agricultural industry, and major projects being approved or underway. Opinions were more divided over other trends, such as the value of the Australian dollar, global oil prices, interest rates, the performance of the mining industry, and commodity prices. The end of the mining downturn? In response to last year’s survey, many of our respondents said that they had been hit hard by the collapse in commodity prices and subsequent downturn in the mining industry during 2015. 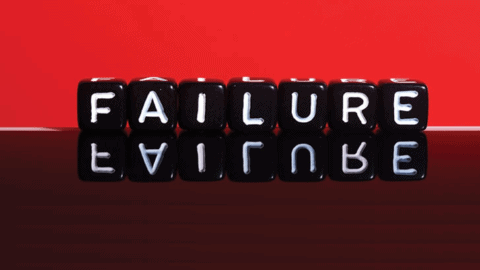 This year, we asked whether they thought we had reached the end of the mining downturn. Opinions were divided on this topic, ranging from, “Yes, there are signs that commodity prices are improving,” to “Yes, but it will remain flat for some time before any recovery,” to “No – American imports from China being restricted will have a detrimental affect on our raw products,” or “No, due to government disincentives and the cost of power”. However overall, a slightly greater number of respondents thought that the bottom of the downturn had been reached than didn’t. Another topic upon which our respondents had vastly differing opinions was the China–Australia Free Trade Agreement (ChAFTA), which removed tariffs on a range of exports and imports. We asked our respondents how this agreement had affected their businesses in 2016. However, many other respondents said that they had noticed little or no impact on business whatsoever. 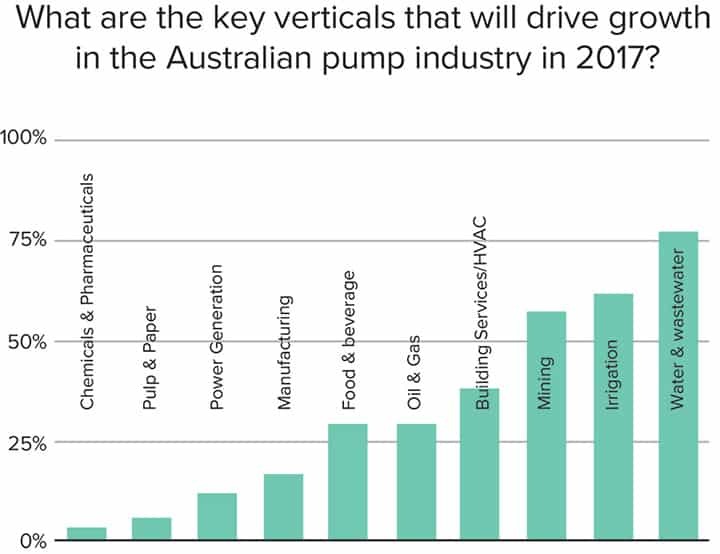 When we asked our respondents which verticals will drive growth for the Australian pump industry in 2017, the water and wastewater industry was the clear winner, with 76.6 per cent of respondents anticipating growth in this area. Coming in second was irrigation, which was expected to drive 2017 growth by 61.7 per cent of our survey respondents. Mining took out third place, with 57.5 per cent of respondents identifying this vertical as a likely key driver of 2017 growth, suggesting that many of our respondents do feel that the worst of the downturn is over. Growth driven by the building services/HVAC industry was expected by 38.3 per cent of respondents, making it the fourth most common choice. Areas that relatively few respondents expected to drive growth included chemicals and pharmaceuticals (4.3 per cent), and pulp and paper (6.3 per cent). No respondents anticipated growth driven by plastics and rubber. This information is represented graphically in Figure 8. Innovation, projects, and efficiency: areas of opportunity In a challenging market, success relies on quickly and effectively taking advantage of the opportunities offered. Our respondents identified a range of major opportunities for Australian pump industry players over the next 12–24 months. Many of our respondents considered upcoming irrigation projects and growth in water-related industries as likely to provide significant opportunities for companies working within those spaces. “The water industry is the sector which will provide the best opportunities,” said one such respondent. A number of respondents believed opportunities could be found by doubling down on service and quality. “The (companies) with local service capabilities will strive and maintain valuable customer relationships, which will be very important for when the projects come back to the discussion table,” said another respondent. Innovation was also considered key to unlocking opportunities, with respondents listing smart pump designs, energy efficiency, and the export of innovative pump designs as likely to provide benefits to those who got in on the game. Many of those who believed low commodity prices had run their course also thought that the mining and oil and gas industries would once again be areas of opportunity. “Increasing capital availability in the mining and oil and gas sectors (offers opportunities),” said one respondent. 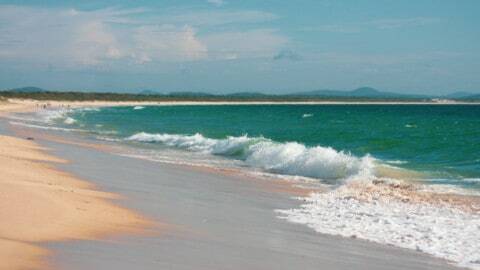 Others saw opportunity in construction projects (both in housing developments and infrastructure upgrades such as sewage bypass projects and backup food production), diversification, smart marketing, and increased export potential with a low Australian dollar. Energy efficiency: the next big thing? The topic of energy efficiency was frequently mentioned throughout responses to a range of survey questions, with many respondents clearly considering energy efficient pumping solutions to provide the single biggest opportunity across a range of verticals in the foreseeable future. Key drivers of the push towards energy efficiency included increasing electricity prices and initiatives by major end user businesses to reduce power consumption. Solar pumps or pumps powered by other renewable energy sources were also mentioned. A number of respondents described potential opportunities from energy efficiency as “huge” or “massive”. One respondent suggested that energy efficiency would “highlight the gap between cheap copies of innovative equipment and the genuine article”. 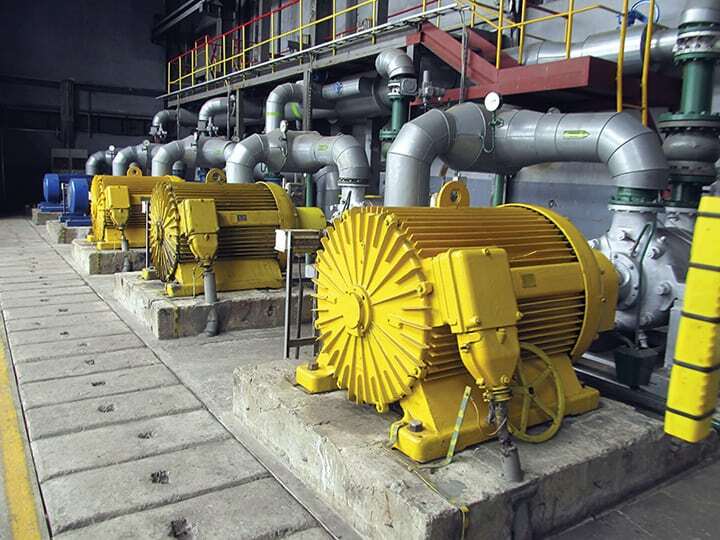 “A lot of customers are looking for energy efficiency in motors and pumps,” said another. Others thought there would be “increased opportunities in renewable power solutions for smaller installations and builds, or as backups,” and that “energy efficiency will provide good opportunities to offer value to existing installations”. Some thought that companies who failed to capitalise on energy efficiency would fall on hard times. “The brands that haven’t focused on efficiency in their design are struggling in our market, particularly on the top end of the market,” said one respondent. “All operational costs are under a microscope, so any inefficient products will have a very hard time staying in place,” said another. However, the push for efficiency was considered more significant in some industries than others. “Most of our equipment is too big to run on electric power,” said one respondent, while another noted that their industry is “not focused on efficiency”. One recurring theme throughout responses was that focusing on energy efficient products would only reward pump suppliers if customers considered long-term costs and weren’t just looking to buy equipment with the cheapest purchase price. Respondents who were less enthusiastic about the opportunities provided by energy efficient products believed that many customers were still too focused on getting the lowest purchase price to care much about energy efficiency, or that infrastructure owners in their sectors had other problems that needed to be resolved first. “Asset owners currently have reliability issues which must be resolved before energy efficiency becomes a real consideration,” said one respondent. 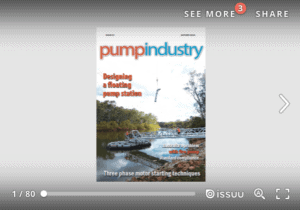 The focus of some customers on purchase price, often at the expense of quality or long-term cost savings, was frequently cited by respondents as one of the major challenges currently facing the Australian pump industry as a whole. “Price is the key driver over technology, expect this to remain,” said another. This issue often interrelated with that of competition from cheap imports, which many said were pushing prices down and having negative impacts on quality. On a more positive note, some respondents believed this trend was changing. “Customers are looking for energy efficiency and total cost of life,” said one. “The cycle is turning, but (focus on cheapest rather than best) will continue for a while yet,” said another. Other respondents saw challenges for the industry resulting from reduced capital spending, lack of adaptation to changing market conditions, lower consumer confidence, the fallout of the US election, the value of the Australian dollar and wages growth. On the other hand, some respondents said they had recently noticed an increase in customer confidence. Other trends in customer behaviour noted by many of our respondents included customers doing more research before purchasing, being more aware of alternative suppliers, and being more willing to buy online. However, whether respondents considered these trends as good or bad varied. “Customers are more informed due to internet access,” said one. 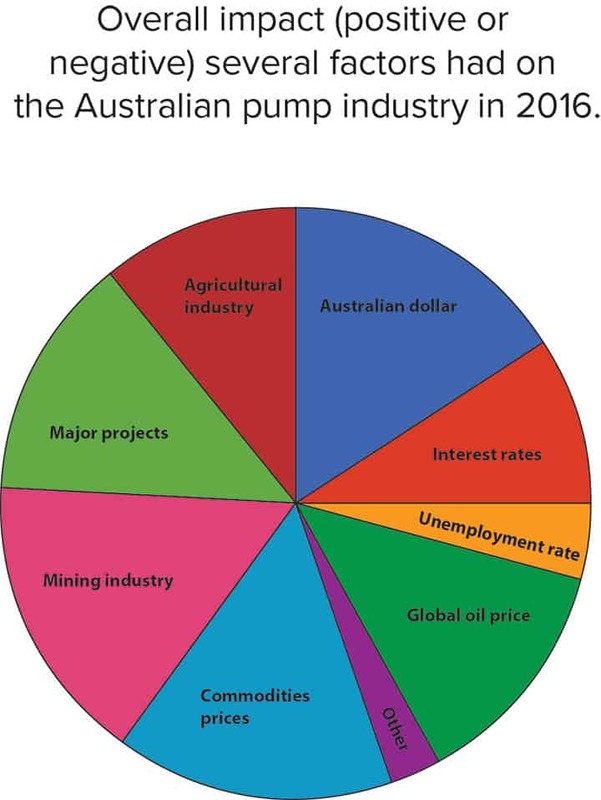 Despite some tough years, the Australian pump industry continues to provide essential products and services to an array of different industries in Australia and across the world. 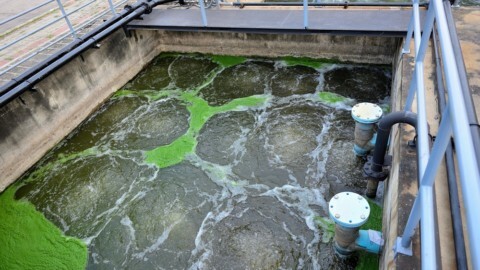 As the tide starts to turn in influential sectors including mining and oil and gas; and as industries such as irrigation and water and wastewater continue to offer promising new opportunities, we are starting to see a generally more optimistic and hopeful outlook for the Australian pumping industry. While 2017 will not be without its challenges, the coming year will also offer various opportunities to companies that successfully adapt to macroeconomic conditions and changes in customer behaviour, and take advantage of innovation and areas of growth.